We awoke to yet another day of crystal-clear skies. 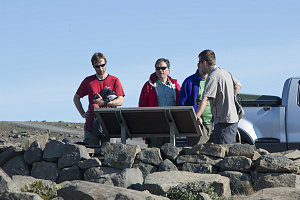 Somewhat surprising, since it had seemed like Iceland did not experience much in the way of continuous sunny days. 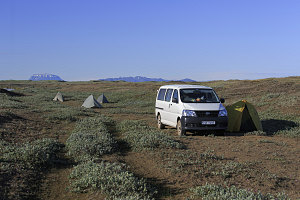 We weren't complaining, however, as we tidied up our at-large wilderness campsite. 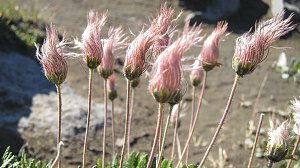 Many little midge-like flies buzzed around us here, although they did not seem to bite. 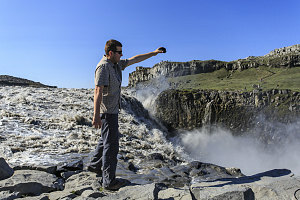 On the itinerary, we had a large grab-bag of northeastern sights to see on this day: Dettifoss, the geothermal features near Lake Myvatn, Lake Myvatn itself, the Goðafoss, the historical site at Laufás, and finally, the city of Akureyri, Iceland's second largest. It was a lot to cover in a day, so we needed to get cracking. 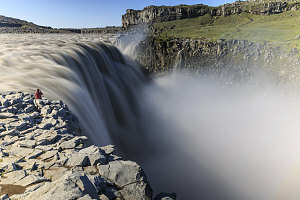 First up was Dettifoss, Iceland's biggest and baddest waterfall. It was only a few tens of kilometres away over a severely washboarded road. 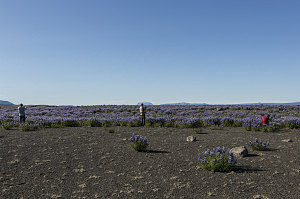 Driving along, we noticed that this part of northeastern Iceland was quite barren - almost desert-like - except for large fields of exceptionally purplish-colored lupines. 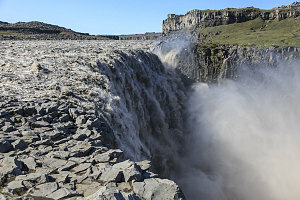 Dettifoss is one of several waterfalls along the Jökulsá á Fjöllum River. 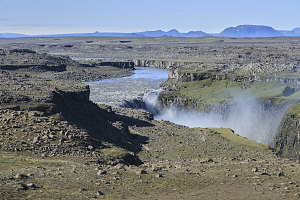 The river drains the northern slopes of the massive Vatnajökull icecap - along with a lot of other terrain - and so can contain an enormous flow of water. 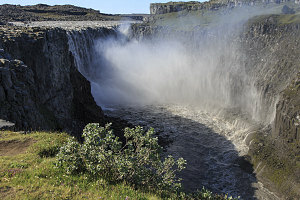 Because of the highly volcanic nature of the lands that it drains, the river is also laden to the hilt with loose volcanic sedminents and ash, imparting it an ominous gray color. Shortly, we arrived at the eastern access point to the falls (there are access points along both sides of the river, and we had chosen the eastern side). 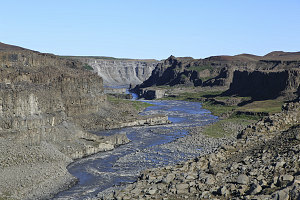 The parking lot for the eastern access to Dettifoss sits on a secondary rim up and a ways back from the immediate rim of the canyon in which the river flows, giving us a broad panoramic view of the river's course and of the wide lands above and beyond. 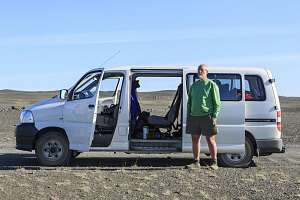 Because this area is part of one of Iceland's national parks (technically it is part of Vatnajökull National Park), it had very nice bathroom facilities, even though it was out in the middle of seemingly nowhere. 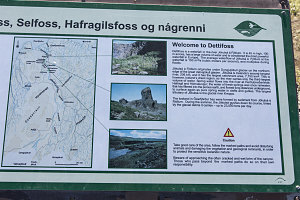 After familiarizing ourselves with the place and reading the interpretive plaques at the trailhead, we began a short hike (less than a kilometre) down towards the Dettifoss itself. We couldn't see the falls directly from the parking area, but the plume of mist and spray from a spot along the gorge showed very clearly where it was. 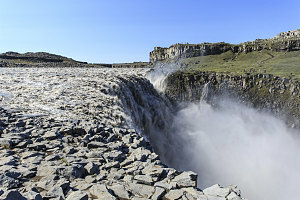 Dettifoss is another of those Icelandic waterfalls that is diagonally-angled with respect to its watercourse. 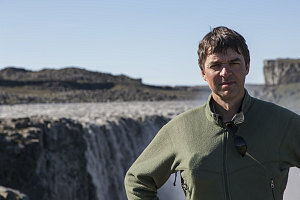 We were on the side that afforded us the oblique view (the other side offered a direct, head-on view), and as a result, our side was more amenable to zoomed-in shots from afar, allowing us to capture the entire breadth of the waterfall in a narrow-angled view. 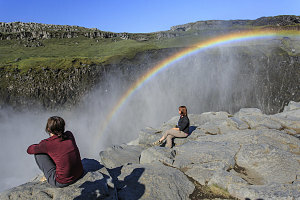 From a vantage point perhaps three hundred metres downstream, we could stand on the edge of the lower gorge and look upstream at the table-flat upper river spilling over into the depths, creating a huge spray of mist and several rainbows. As we had read, the water was indeed laden with sediment. It looked like liquid concrete. We spent a lot of time sitting at the edge of the gorge downstream of the falls, soaking in the atmosphere of the place. The warm sun and calm winds did nothing to encourage us along. 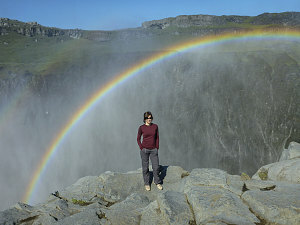 Needless to say, some of us spent a lot of time trying to find the ideal viewpoint to properly photographically capture the sense of the falls, the mist, the layers of basalt lava embedded into the cliffs, and the pretty rainbows. 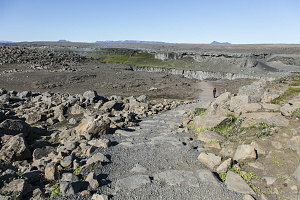 We eventually made our way up to the flat cobblestone-y rocks right to the edge of the falls - its vast power perhaps causing a slight vibration beneath our feet. 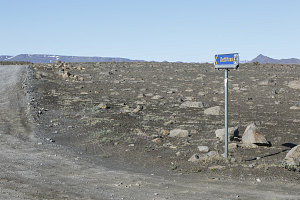 It was clear why Ridley Scott chose this place for one of the major introductory scenes to the recently released movie Prometheus. 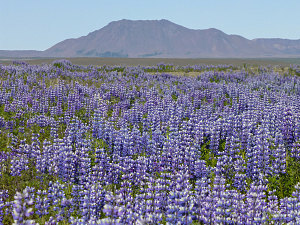 Remove the colorful blue sky and replace it with a sullen overcast and you have the perfect primeval world scene. 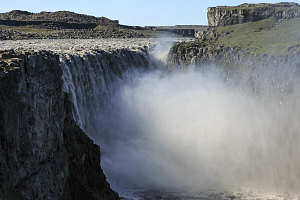 Proving once again the Iceland is a place that is truly elemental! Given that several of us had recently seen Prometheus, and given that we were now standing on the precise spot where the striking initial "Engineer" scene takes place, we decided to perform a re-enactment, with Chris standing in for the burly albino Engineer. 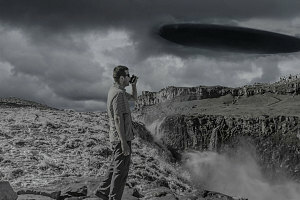 We needed two takes, since Chris had forgotten how the scene went, but on the second attempt - if you look at the picture - we captured the scene so accurately that you can practically see the Engineer ship lifting through the clouds above. Well done, Chris! While all of the heavy-duty picture taking was going on, Ewart wandered off along the hiking trail to the north. 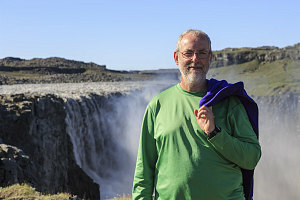 This trail led to another spectacular waterfall - Selfoss. I didn't feel we had time to examine both of these waterfalls, so we sent Caroline off to retrieve Ewart and the rest of us returned to the parking lot. 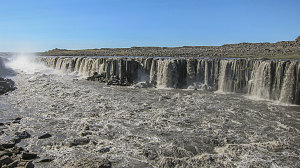 Caroline ended up catching Ewart at Selfoss, and so before she and he hurried back, she captured a nice shot of the river spilling over the hexagonal columns of Selfoss. Nice. 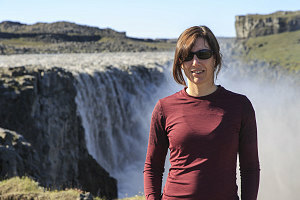 A video sequence covering our visit to Dettifoss. Click directly on the image below to start it.